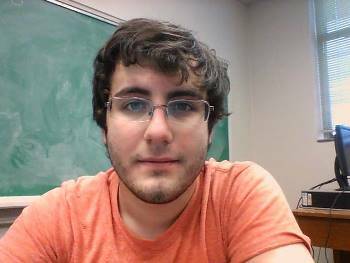 Blaine Rutland, a junior physics major in Louisiana Tech University’s College of Engineering and Science, has been awarded a Blue Waters Internship Scholarship (BWIS) to participate in a two-week intensive high-performance computing workshop. Blue Waters Scholars receive a stipend of $5,000 to participate in a High-Performance Computing (HPC) summer training program at the National Center for Supercomputing Applications and complete an HPC research project at their home institution. Rutland’s research project, performed in the Theoretical Molecular Biology Lab at Louisiana Tech and mentored by Dr. Thomas C. Bishop, associate professor of chemistry and physics, uses HPC to investigate how the material properties of DNA on the atomic scale affect genomic function on coarse-grained scales, see images. Characterizing relationships between DNA’s atomic structure and DNA sequence is an essential step to advancing our understanding of personalized genomics and epigenetics. Bishop notes that the internship provides students with training and networking opportunities important for students working in genetics. “The computational modeling of genetic mechanisms in my Theoretical Molecular Biology Lab requires tremendous computing resources,” Bishop said. “Members of my lab routinely utilize world-class high-performance computing resources available from the Louisiana Optical Network Initiative (LONI), the National Center for Supercomputing Applications and the Extreme Science and Engineering Discovery Environment. Blue Waters sponsors 20 undergraduate research interns each year. The interns engage in petascale computing research and development projects, and travel to The Blue Waters Symposium at the National Center for Supercomputing Applications. This award marks the second year in a row that a student from Louisiana Tech has been awarded the scholarship. Last year two students, Anik Karan, graduate student in biomedical engineering, and Ran Sun, graduate student in chemical engineering, received BWIS.